Friedman announces her retirement from CNU. A reception for retiring faculty member, Cheryl Mathews. Announcement of Retirement party for Dr. Anne W. Perkins, Professor of Leadership Studies. Announcement of a retirement reception for Patricia Patten, Dean of Admissions. 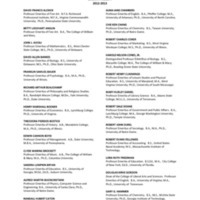 List names and departments of CNU faculty with emeritus status. 4.10 Invitation to Dr. Joseph F. Healey's retirement celebration. 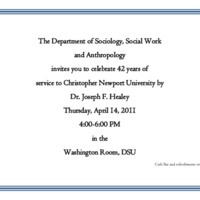 An invitation to Dr. Joseph F. Healey's retirement celebration on April 14, 2011. 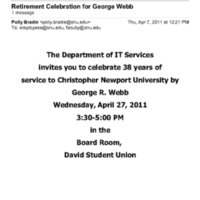 An email announcement of a retirement celebration for Dr. George Webb on April 27, 2011.